When I picked up The Tiger’s Daughter (2017), I didn’t know what I was getting into. Written as a long, dramatic letter between two old friends, it is an epic tale of loss, faith, political intrigue, and forbidden love. The Tiger’s Daughter is the debut novel from K. Arsenault Rivera, and set to be the first book in the series titled THEIR BRIGHT ASCENDENCY. The Tiger’s Daughter wends its way from the first time our heroes meet, over their entire lives, and up to the present — where one friend, the empress O-Shizuka, is reading said letter (the letter itself being the bulk of the book) from the other, Barsalayaa Shefali. Both are heirs to very different thrones and handle that knowledge differently — as befit their starkly different upbringings and wider global status. They are two individuals at the heart of peace, politics, and espionage. The peoples in The Tiger’s Daughter are inspired by a variety of Asian nations, most prominently: China, Japan, and the Mongols. In this way, the story’s setting mirrors that of countless other fantasy epics (that is, being loosely based on a medieval setting) — but this time, the inspiration comes from outside of ancient or medieval Europe, and instead takes cues from ancient and medieval Asia. I don’t dislike the prevalence of medieval Europe as a base or reference point for settings in fantasy fiction, but I was no less delighted to be reading an epic tale with a setting based on Asian antiquity. Like the European counterparts, much of the historical references were likely lost on me. I have not studied history with any depth, so it is likely that this book (and I would go so far as to say this ‘type’ of book) will play very differently for someone who is more well versed in varied histories. Maybe that reader would be able to nod along to some of the epic scenes with recognition. That being said, I did not feel like I had to be an expert on any particular time period or place in order to understand and enjoy the story. I recognize that it’s probable I missed some references, but the book still felt chock full of meaning, interest, and intrigue to me. The story begins when O-Shizuka, the Empress, receives a letter from her oldest and closest friend who, for reasons unknown to the reader, she has not seen in years and misses deeply. Her ‘old friend’ is Shefali, a famous warrior. Shefali has written a history of their lives in the form of an exceedingly long letter. It is a dramatic retelling of their intertwined fates, with added commentary of what Shefali was thinking along the way — giving the retelling new context and even deeper meaning to O-Shizuka. The first two chapters or so necessitated an adjustment on my part as the reader when I realized that the letter wasn’t going to end any time soon. Once I understood that approximately 90% of The Tiger’s Daughter was to be this letter, I relaxed into the format and deeply enjoyed the telling of the story. Even though the story being told includes the person reading it (as per the narrative of the letter), I believed O-Shizuka’s engagement with the letter of events she lived through because: 1) I believed her yearning for contact with her lost friend, and 2) I believed her characterization of never doing anything by half. She was going to read the entirety of a book-long letter from Shefali, no matter how much of it she already knew, and she was going to do it without interruption. My belief in these facts about the Empress stem directly from the author’s strength in writing the character. O-Shizuka is bold, unbending, confident, and most importantly methodically steadfast in all things she does. Therefore, this is the kind of person who would put her duties as Empress on hold indefinitely to properly appreciate the sole communication she had received from the close friend she mysteriously (to the reader) lost years before. Throughout the story the archetype of the warrior woman is explored. Both main characters are descended from the greatest warriors in the world — their mothers, who are also best friends. This theme of exceptionally (god-like) skilled female warriors extends throughout the story and colours the entire narrative as one where women are not only part of the armed forces but can and do actively inspire and lead elite teams. This active choice is something I was fascinated by through the tale. It serves as a thematic thread that I enjoyed watching crop up in unexpected places. The nature of the speculative in The Tiger’s Daughter revolves around systems of faith and the existence of demons. The lore suggests that there is a family of gods, and that the Empress or Emperor at the time belongs to that family. Among the gods are those who have been cast out, and whose rebellion includes the legions of demons and individual demons who plague the neighboring nations. Furthermore, those who come into physical contact with any demon become “black bloods” — infected by the darkness and resurrected as demons themselves — if their bodies aren’t burned first. O-Shizuka and Shefali, young warriors descended from demon-killers, dream of slaying demons. Both of their mothers have completed the almost impossible feat of slaying a demon, thus proving to the two young warriors that it’s not only possible, but it’s in their blood. The immense pressure of that legacy affects both women differently. The dichotomy of how they carry that legacy is something I deeply enjoyed watching unfold throughout the story. The main characters fall in love in The Tiger’s Daughter. They are both warriors, they are both future rulers of different nations, and they are both women. All of those aspects of their lives make their love complicated. This section has been hidden for spoilers because I, myself, did not know that’s where the story was headed. With some light research, it is somewhat clear that The Tiger’s Daughter is billed as having a f/f (female with another female) romance. However, in the case the prospective reader hasn’t come across that, I think there is a great deal of enjoyment to be had by finding that particular plot point out organically. I think it is a bit of a shame that in some places the romance between the two main characters is part of the description of the book, as the romance aspect is not an early-book reveal either. That all being said, I think that the author expertly navigated Shefali and O-Shizuka’s friendship into close friendship, and then into romantic love with great skill and care. Their relationship, with perhaps one early example, was believable and well plotted — in a slow-burn kind of way. Of course, this is all coming from the standpoint of someone who was unaware of the romantic turn going into reading. The Tiger’s Daughter has experienced a certain amount of controversy. There are reviews that are calling this story racist. One of the cited complaints is the use of racist language by characters in The Tiger’s Daughter. Racial slurs do play a part in the narrative. There are characters that hurl racially charged insults or mutter them when they think no one else can hear. I found that those characters who consistently use racial slurs or judge the heroes based on their complexion or nose shape are villains at most, or at least, deeply misguided. In all the cases that I came across the racist language was something I noticed — and I also noticed that is was being used by villainous characters outright, or by misguided characters who were ultimately wrong, and judged or confronted accordingly. With the context of the use of racial slurs (who they were said by) I don’t think this book is racist. I think it deals with race in a way that many people live it — and then The Tiger’s Daughter gets to give those characters the villain treatment, making it very clear that their ideas about racial superiority aren’t being condoned. Going a step further, part of the discussion in other reviews of The Tiger’s Daughter centres on discussing the author as racist as an extension of the racial slurs used by characters. I think in this discussion, it’s important to consider where the racism is coming from. In this case, it isn’t coming from the heroes or from the narration, but explicitly from villainous characters. I think this is important because it reflects ideas that using racial slurs is a negative attribute, and in this case, it seems clear to me it’s not something the author is promoting, but instead portraying as negative. Finally, The Tiger’s Daughter portrays another layer of the realities of racism. There are instances where Shefali, a woman of mixed racial heritage, uses racialized language when referring to herself in her own internal monologue. I got the distinct impression of this being a person who, having heard the language weaponized against her over her entire life, has internalized those ideas. This characterization felt far from an acceptance of racist ideas, but rather a viscerally real reaction an individual might have if they have grown up surrounded by people who call her names. Although it could be hard to read (too close to home or too relatable), it was very believable to me to see Shefali having internalized some of the attitudes that have been forced upon her. Ultimately, a character with a confused sense of self and some persistent issues with self esteem didn’t feel like a flaw to me — but rather, a strength of the writing and characterization. The Tiger’s Daughter portrays some all-too-real attitudes, and then portrays some very true-to-life reactions to those attitudes in the actions of the main characters. To me, that is a mark of some strong characterization rather than a flaw of the story. The Tiger’s Daughter gripped me from start to finish. It is imperative to understand quickly that the bulk of the book is told through a letter one of the main characters (who, herself, is portrayed in the letter) is reading. With that, the story and most particularly, the characters, demanded my attention. This epic tale is gripping in scope and stakes and balances them expertly. I highly recommend picking it up. The next book in THEIR BRIGHT ASCENDENCY, titled The Phoenix Empress, will be available to purchase in October of 2018. I will be keeping an eye on this series and I am excited to see if the follow up is as engaging as the first installment. I rarely have such a gap in the overall review score as I do with Skye and The Tiger’s Daughter, by K. Arsenault Rivera, which just goes to show how subjective this whole review thing is. While Skye gave the novel a five-star rating, this was about as close to a DNF as I get. 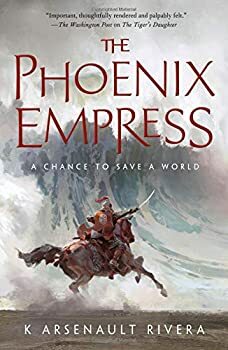 It was a real struggle to keep going, and if it weren’t for the fact that I’d just received the ARC of the sequel, The Phoenix Empress (which is what prompted my picking this up), I’m absolutely sure I would have stopped reading somewhere in the first half of the story. While I do think it ended more strongly, I can’t say the close was worth the several hundred preceding pages. I won’t bother recapping the plot since Skye has done that already in sufficient detail. To begin then with the positive, like Skye I enjoyed the relatively unusual (though less so in recent years) Asian-inspired setting. I don’t mind the typical medieval western Europe background of most fantasy, but anything set elsewhere does feel more fresh, as did the female-centric focus (sad as it is to say that this feels “fresh”). 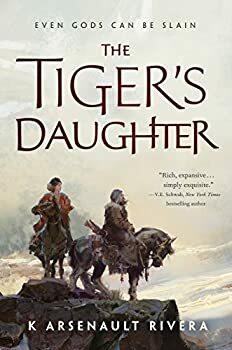 I also mostly enjoyed the mythological/ background to The Tiger’s Daughter, with its black bloods and demons and Big Bad “Traitor,” along with the less epic/more folkloric tales sprinkled throughout. And the writing was, for the most part, smooth and vivid, with moments where it rose to higher levels of eloquence. Finally, I particularly liked the backstory of the two main characters’ mothers, both strong female warriors who rose to power both together and also in their own fashion. In fact, and this starts to get into why I was so close to a DNF on this, I was far more interested in the mothers’ stories than their daughters. My biggest issue with The Tiger’s Daughter was one I rarely cite in a review; I was bored. Part of that came from the preternatural abilities of the two main characters. While I can understand intellectually that they are “special,” it just doesn’t interest me much when a character can disarm an opponent in a split second, or when an archer never misses. It didn’t help that the abilities manifest in them as children, an issue worsened by the fact that they didn’t talk or act like children at all in my mind (overly precocious children are a pet peeve of mine in books and films). Then there was the structure, which I still haven’t figured out. In fact, I’m so confused by it I feel like I must have missed something major (feel free to enlighten me in comments those who have read the book). It’s told in epistolary format, as one uber-lengthy letter from Shefali to Shizuka detailing their experiences over the years. Which in and of itself is fine; some of my favorite books have that format. But so much of this falls into the “As you know, Bob … “ trope that I just couldn’t figure out why Shefali was telling Shizuka in such painstaking detail everything that Shizuka already knew. Oh, now and then Shefali gives an insight into what she was thinking that would be news to Shizuka, but those sorts of moments would be surrounded by details of setting and action that just didn’t make any sense to me given that Shizuka was right there. I kept waiting for some twist as to why this was happening, and as I said, maybe I missed it, but I ended the novel as befuddled about this choice as I began it. I also found it annoying stylistically as the structure called for so much “I” and “You” that it felt repetitive. The plot was slow, I thought, and never really engaged me. The flashbacks, as noted, had issues of implausibility or annoying precociousness, little tension, and felt like it just plodded along from place to place and scene to scene. The contemporary scenes, with Shizuka reading, were, well, a woman in a room reading. As for the characters, neither felt fully fleshed out to me, both feeling a bit one-note. Shizuka, in addition, just wasn’t likable; I found I just didn’t care much what happened to her. I don’t know what to tell any of our readers with such a huge gap in response. I guess I’d say give The Tiger’s Daughter a shot, and if you’re lucky you’ll fall more toward Skye’s response than my own. I’ll give the sequel a chance since it just showed up on my doorstep, but I’m certainly going to be quicker about giving up if it doesn’t grab me early. Published in 2017. Even gods can be slain. The Hokkaran empire has conquered every land within their bold reach―but failed to notice a lurking darkness festering within the people. Now, their border walls begin to crumble, and villages fall to demons swarming out of the forests. Away on the silver steppes, the remaining tribes of nomadic Qorin retreat and protect their own, having bartered a treaty with the empire, exchanging inheritance through the dynasties. It is up to two young warriors, raised together across borders since their prophesied birth, to save the world from the encroaching demons. This is the story of an infamous Qorin warrior, Barsalayaa Shefali, a spoiled divine warrior empress, O Shizuka, and a power that can reach through time and space to save a land from a truly insidious evil. A crack in the wall heralds the end…two goddesses arm themselves…K Arsenault Rivera’s The Tiger’s Daughter is an adventure for the ages. I need to hurry up and read this so we can share thoughts! I had no idea what this book was about, although I’ve seen it and heard a few things about it. I’m glad you mentioned that it is mostly in the form of one long letter! I think that would have been an adjustment of expectations for me otherwise. A thoughtful review, Skye. Thanks. It started out so great (actually the first half and a little beyond that). But then all the Big Questions that gave the story suspense, like who is the Traitor, how can they stop the horrid disease, etc., just kind of faded out. Being saved for book 2, maybe? It was pretty disappointing to not end up making any progress on the underlying problems the world in the story was plagued with. Even a few more clues or a hint of a possible solution would have helped. I also found it bizarre that Shefali’s mother just let her and Shizuka wander off and made no attempt to find them. Being the best swordswoman in the world wouldn’t have helped if someone dropped a net over their heads followed by a couple of large rocks. That they’re allowed to roam off in romantic bliss, with no one apparently caring for the longest time, seemed unbelievably dumb on the part of their elders.